La Chaire Unesco en Ressources Educatives Libres de l’Université de Nantes organise un workshop le mardi 16 octobre 2018, à Nantes, dans le cadre du projet Européen X5-GON. Le thème est : Nouvelles technologies pour l’éducation ouverte. Plus largement, le colloque entend faire le point sur des technologies, et en particulier celles basées sur l’intelligence artificielle et voir en quoi elles peuvent –mais bien entendu pas seules !- apporter des solutions aux défis de l’éducation ouverte. leur capacité à changer l’éducation. Les présentations et tables rondes (en langue Anglaise) auront lieu dans le laboratoire LS2N, à Nantes. Toutes les informations pratiques peuvent être trouvées ici : https://www.x5gon.org/event/tech-for-oer/. Le workshop est gratuit mais avec un nombre limité de places. Il est donc impératif de vous inscrire le plus vite possible. Pour cela veuillez contacter : Colin de la Higuera : cdlh@univ-nantes.fr. Alfons Juan (Universidad Politecnica de Valencia, Spain): “End-to-end communication tools for OER”. Alfons is senior researcher at Universidad Politecnica of Valencia (https://www.mllp.upv.es/ ) and has led his team in various European projects in which they have developed technologies to transcribe and translate scientific and educational videos. They now aim to deliver an end-to end solution, with the translation being given through voice synthesis including voice models for the original speaker. Mathias Bouckaert (OECD, Paris): « Open educational resources across the OECD, current state of play and emerging trends ». Since the Centre for Educational research and Innovation at the OECD first published its report on “Giving Knowledge for Free” in 2007, the degree of development and use of OER has significantly increased across education systems as highlighted in the report “Open Educational resources: a catalyst for innovation” (Orr et al., 2015). The presentation will place perspective in the debate by portraying those evolutions and their implications for policy. It will also feature more recent work conducted at the OECD around the topic of open higher education and its potential repercussions on selection, quality and costs. Thomas Cerqueus (Lengow, France): “Thesaurus matching: a use case in e-commerce. “Lengow is concerned with proposing systems allowing retailers to efficiently propose their product on a wide variety of online merchant sites. It may be the case where the same technologies could help courseware be deployed over a variety of platforms with much less effort than today. Perrine de Coëtlogon (Blockchain & Education advisor at Université de Lille, France): “How will blockchain contribute to the Open Educational World Movement? 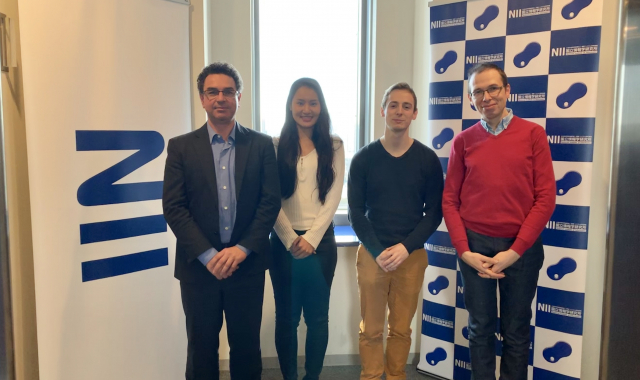 Perrine hosts a digital working group at national level on Blockchain and Education (Blockchain4Edu) within the directorate for pedagogical innovation of the University of Lille (France). Perrine de Coëtlogon and her colleagues envisage that in an open learning environment it will be necessary to be able to trace the different contributions to open educational resources. They aim to use a Blockchain solution for this. Marko Grobelnik (Josef Stefan Institute, Slovenia): Title to be announced. Marko is Slovenia’s digital champion, a recognized researcher in many fields inside Artificial Intelligence and Digital Champion for Slovenia (https://en.wikipedia.org/wiki/Digital_Champions). Mitja Jermol (Josef Stefan Institute, Slovenia). Mitja is Unesco OER technologies Chair and has been the founder and leader of the Open Education for a better world Mentoring Program http://unesco.ijs.si/project/open-education-for-a-better-world/. The Slovenian Unesco Chair puts a special emphasis on the technological aspects of Open Education. Benjamin Ninassi (INRIA, France): “Hybrid Social networks of learners”. Benjamin is Research engineer at INRIA, technical leader of the IT development team and main developer of the Class’Code Platform (http://classcode.fr ). The platform aims at helping teachers and educators learn to teach code through online activities and the promotion of a social network built from these activities. Samuel Paccoud (FUN, France): « Scaling our Open Education infrastructure with microservices ». Samuel is CTO at FUN, the main French speaking MOOC platform (https://www.fun-mooc.fr/) . His talk will be about the convergence and interoperability of online learning tools through shared formats and norms. John Shawe-Taylor, (UCL, United Kingdom). John is Professor at University College of London, a trustee of the Knowledge for All foundation and the holder of the first Unesco chair in Artificial Intelligence. He leads the X5-GON Horizon 2020 project whose goal is to build an efficient ecosystem for Open Educational Resources. Jutta Trevinarus,: “Smarter Systems Include the Margins”. Jutta is Professor at the Ontario College of Art and Design University (OCADU) in Toronto Founder and CEO of the Inclusive Design Research Centre At the Inclusive Design Research Centre proposals are being made to allow web navigation (and more specifically learning) to be more inclusive and friendly.